Padmapani on the Half Shell, watercolour painting by Anandamuni Shakya, circa 1940. This article on Anandamuni was essentially compiled from notes of an interview that I made with his son Siddhimuni in 1999, with my late friend Phunsok Tsering acting as translator. Over the course of the next few years I tried to discover as much as I could about the lives of Anandamuni and Siddhimuni, much of which was anecdotal, for they were already legendary characters in a legendary landscape, and neither Siddhimuni nor any of his family spoke English. On my behalf Phunsok had got to know Siddhimuni quite well in his last few reclusive years, and I am indebted to Phunsok along with several other friends, most especially Uday Charan Shrestha, Janaki Man Shrestha, and James Giambrone, for their deep understanding of these true geniuses of Newar Art. Anandamuni Shakya was born in 1903, close to the Buddhist temple of Itum-bahal in the old market area of Kathmandu. Itum-bahal dates back to the 14th century and houses a statue of White Tara known as the 'Talking Tara', on account of its miraculous ability to occasionally speak or prophesy. Anandamuni's father, Rajmuni Shakya, worked as a tailor for the royal family; he was a gifted singer of devotional songs or bhajans and had some talent as an artist, but his son soon began to display an innate gift as a draughtsman. However, Anandamuni didn't get along so well with his father and mostly stayed at the house of a friend named Buddha Ratna, who lived nearby in the Jana-bahal temple area. Jana-bahal houses an image of White Padmapani Lokeshvara, who is commonly known as Seto Macchendranath, and here Anandamuni became active as a bhajan singer. Adorning the exterior side walls and back of this temple are framed paintings of the hundred and eight manifestations of Lokeshvara, which were later painted in 1965-66 by Anandamuni's son, Siddhimuni Shakya. As a teenager Anandamuni became skilful as a portrait painter and for a time served as a student under the illustrious Newar artist Purna Man Chitrakar, who reportedly declared that Anandamuni would later become equally as famous an artist as he was himself. A chalk drawing of a tiger that Anandamuni made also so impressed a wealthy merchant named Chaiti Ratna Shakya, that he resolved to take the young boy with him on his forthcoming journey to Tibet. They traveled together for fifteen days to reach Lhasa, where Anandamuni was to remain for the next year, working as an artisan and paid laborer in the house that this merchant owned near the Barkor in Lhasa. Anandamuni was 18 or 19 years old when he went to Tibet, so this would have been around 1921. Evidently things were not at first easy for Anandamuni in Tibet, where he was once rescued by some Tibetans after falling from a cliff. But it was in Lhasa that he first began to gain fame, for the portraits that he painted of some Tibetan aristocrats, including the Regent of the 13th Dalai Lama, brought his work to the attention of the Dalai Lama himself. Such that when he was summoned to the Potala the Dalai Lama recognized him as a 'divinely inspired artist' and rewarded him with some silver coins, silk brocade, and most importantly an ample supply of the finest natural mineral pigments from one of the Potala's ancient storerooms. Most of these rare pigments are still used by Anadamuni's grandson, Surendra Man Shakya (born 1967), to this day. It is not known whether any Tibetan artist actually taught Anandamuni during his year in Lhasa, yet the Tibetan influence upon his painting style was great, as if he had lived there for many years. When he was twenty he returned to Kathmandu for his marriage ceremony and began to produce Tibetan style paintings for a merchant in the Kohiti market area of Kathmandu. He briefly traveled to Calcutta, where he was attacked by bandits and only escaped after wounding one of his assailants with a well-aimed knife. He also spent four or five months in Allahabad where he studied music and learned bhajan singing in the vocal styles of Gwalior and Lucknow. Besides music, which he had always loved since childhood, he also learned carpentry, woodcarving, repousee metalwork, and evidently worked industriously throughout his entire life. But above all Anandamuni was a free spirit as far as artistic innovation was concerned, and he began to introduce three-dimensional effects into his unique style of Newar paubha painting. These included the heightened use of preternatural light and shadow, the use of black and white or sepia pigments to simulate the photo-realistic effects of early flash photography, and a meticulous attention to anatomical and ornamental detail. Into his deity depictions he introduced ornate aura and halo designs from early Indian Kushan art; perspective and posture drawn from Italian Renaissance art; luminous metallic and textural cloth effects; and a rich abundance of natural vegetation that often included a profusion of leaves, thick entwining stems, bulbous fruits and voluptuous flowers, each of which might cast its own shadow upon what appeared behind it. He introduced unusual flowers, such as roses, into some compositions; coiling and roaring Chinese dragons to the upper sky; an outer brocade-like border that surrounded the central composition, with a stylized lower plaque that usually contained an invocation to the deity and his own signature in the ornate Newar script known as Ranjana. 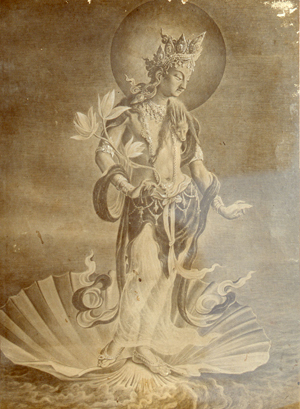 In several of his monochrome deity depictions Anandamuni was specifically influence by the work of Sandro Botticelli; such as in his depiction of 'Padmapani Lokeshvara on the Half Shell' (shown above), where the scallop shell itself is precisely modeled on the shell in Botticell's 'Birth of Venus'. The graceful rendition of postures, hands, the lilting turn of a head, and a deity's billowing diaphanous robes also reveal much of Botticelli's 'feminine' influence. Uday Charan Shrestha once showed me a photograph of a sepia painting of Mahakala that Anandamuni had painted, which was based upon the mirror image posture of Venus from Botticelli's famous 'Primavera' painting. This unusual painting portrayed two-armed Mahakala in the form of an ageing man, with the protruding veins on his hands, arms and feet prominently revealed. The influence of black and white photography on Anandamuni's work almost certainly stems from his association with Kaiser Shamsher Rana (1892-1964), the third son of the Rana Prime Minister, Maharaj Chandra Shamsher (1863-1929). In 1908 Kaiser accompanied his father on a year's visit to England and France, where the precocious sixteen-year-old Kaiser first began to cultivate an appreciation for books, fine art, photography, gardening, wine and beautiful women. Amongst his various official positions Kaiser eventually served as Director of the Royal Museum and Archeology Department from 1928-39, and later as patron of the Nepal Cultural Society. His cultural legacy endures through the Kaiser Library (Kaisar Pustakalaya), Kaiser Palace (Kaiser Mahal), and the Kaiser Garden (Kaiser Bagh) - now known as the "Garden of Dreams" - which were bequeathed by his second wife to the Government of Nepal in 1968. The Kaiser's Western friends included the orientalists Perceval Landon, Sylvain Levi, and Giuseppe Tucci - whose portraits still hang in the Kaiser Library - along with that of a photographer named Richard Gordon Matzene. 'Count' Richard Gordon Matzene (c.1875-1950), of enigmatic ancestry, was a highly successful portrait photographer, who opened studios in Chicago, New York, Los Angeles, Shanghai, and Simla in India at various times during his life. In 1930 he was invited from Simla to Nepal to photograph the ruling Rana elite, returning again in 1936 and 1940, during which time he developed a close friendship with Kaiser. In 1937 Kaiser traveled to London, where the famous Hungarian artist Philip de Laszlo (1869-1937) painted his portrait. This event was recorded in a photograph taken by Matzene in Laszlo's London studio. Kaiser then traveled to America in 1939 where he again met with Matzene, and the two men maintained a correspondence for many years. The official silver-plate photographic portraits taken in Nepal by Matzene in 1936 and 1940 captured the Ranas in all their ceremonial pomp and glory, with masses of chains, medals, plumed helmets, and ornaments of gold or polished silver adorning their richly embroidered costumes and military garments. The hyper-realistic three-dimensional effects of these precisely focused black and white photographic portraits, coupled with the fact that they were then framed behind glass, seemingly had a profound impact on Anandamuni's imagination. For during the 1930's and early 1940's he was also being commissioned to paint portraits of various dignitaries in Nepal, including several of the Ranas and their offspring. At the home of a Newar merchant named Narottam Das Shrestha, I was shown a black and white portrait of Babber Shamser that was painted by Narottam himself in a similar style to Anandamuni's, which appears to have been derived from a photograph taken by Matzene; another of Narottam's more ambitious oil paintings depicts a Rana woman wearing a ballroom gown and costume jewelery. Narottam Das owns several paintings by Anandamuni, one of which was a black and white moonlit scene depicting a coach and horses at a European inn; another was a watercolour painting of a 'woman in pink', which bears the title of "Swopnil", meaning 'in a state of dreaming'. Narottam told me that he and Anandamuni had together opened Kathmandu's first art gallery on New Road in 1940, following the city's reconstruction after the great earthquake of 1934. The gallery remained open for four years until Anandamuni's death in 1944, during which time only one painting was sold! Narottam continued collecting art throughout his life, and his collection includes several other pieces by Anandamuni, a set of delicate drawings and a painting of the 'Death of King Dharmaketu' by Siddhimuni, along with many other important works by the greatest Newar artists of the last century, such as Dinesh, Mahesh and Uday Charan Shrestha, Manohar Man Pun, Lainsingh Bangdel, Amar Chitrakar, and Devendra Man Sinkhwal. This year Uday Charan Shrestha received a well-deserved award from the Federation of Handicraft Associations of Nepal (FHAN) for being Nepal's "Best Artist of 2012". Another group of several important deity paintings by Anadamuni are held by Prithivi Pandey, the chairman of the Nepal Investment Bank. Mr Pandey's grandfather was a patron of Anandamuni and also commissioned his own portrait from him. The deity paintings clearly showed how Anandamuni had already formulated the unique Newar style that his son Siddhimuni was later to expand upon, with its thin inner brocade-like border, and its wider outer border or 'torana' containing mythical creatures with the artist's signature upon an embellished lower plaque. Mr Pandey's collection also includes several of the finest modern compositions made by Siddhimuni's son, Surendra Man Shakya (born 1967). The artist Manuj Mishra also inherited a portrait of his father, Tulsi Singh Mishra, that was painted by Anandamuni. Several of the paintings made by Anadamuni for temples and monasteries in Bungamati and Lumbini were made into prints that were once commonly found at many Newar houses throughout the Kathmandu Valley, but few of these have withstood the ravages of time. One of the Lumbini prints was a black and white depiction of Shakyamuni Buddha. But Anandamuni's most famous black and white painting is his Padmapani Lokeshvara, which now hangs in Kathmandu's old Royal Palace of Hanuman Dokha as part of the private collection of the late King Tribhuvan Shah. Siddhimuni also told me that his father had drawn some of the designs for the first banknotes of Nepal, which were only issued in 1945, a year after Anandamuni's death. These drawings included the eight auspicious symbols, entwined naga-serpents, dragon, tiger, garuda and kirtimukha head designs that were typical of the elements found in his paintings. A self-portrait of Anandamuni still hangs on the wall of their present family home, along with another self-portrait painted by Siddhimuni and a tiger he drew in his youth. Anandamuni had two sisters and seven children, and he died in 1944 at the age of 42 according to the Newar calendar, which gives his 'Nepal sambat' dates as 1959-2001 (1903-44). His father lived to survive him, and of his seven children only Siddhimuni and his sister were alive at the time of this interview in 1999. Text by Robert Beer, 29th July 2012.